Good "Old Fashioned" service is a rare thing today yet I have continually been extremely surprised that it still does exist. Well it does with your business! and I appreciate it tremendously. Nick from your Service Department has been exceptional with his interest in my vehicles heating problem and his desire to help me get it sorted out. Earlier in the year I have the radiator overhauled by your firm, as well as a new viscose fan etc installed in my vehicle. I never again tested or loaded the vehicle as in hill and towing duties until Labour weekend when it heated up again. It appeared the fan unit was faulty and my mechanic suggested flushing the radiator at the same time. So I came back and Nick had the job done within a tight time frame and also suggested that a "hot flush" would be in order as my mechanic had said "muddy water" came out of the system. The fact that Nick remembered myself and my vehicle impressed me as did his genuine concern to get the problem solved. I felt your prices are fair and cannot fault the quality of either the work undertaken or the service standard. Please accept my thanks for the work undertaken and rest assured that I will recommend A1 Radiators to all I come across without any hesitation at all. Last Monday I spend over four hours taking apart the dash of a Corona to get to the heater unit which I then took to your Service Department for repair. I was in a pretty bad mood and anxious about getting the parts back together in the right order. I was served by Nick and from start to finish I was impressed. He was helpful, understanding, clear and I walked away feeling what a good business. Later he rang to say when the work was completed. I've remembered it over the week so I thought I would email this acknowledgement of excellent customer service. Firstly, many thanks for the repair work you undertook on the radiator out of my 1927 Cadillac La Salle. I have recently taken the car for a run and the louvre operation works perfectly. I take this opportunity to commend those that not only undertook the work, but those who also assessed the work involved and were supportive and willing to tackle such a difficult job and follow it through with professional advice and with a genuine understanding of the importance of originality. People like yourself and those you employ that have the expertise and patience required for this specialists work enables us to keep these types of vintage vehicles on the road. I will certainly be putting the name "A1 Radiator Specialists" forward at every opportunity available. "It's a pleasure to deal with a company that treat their customers as an important part of the jigsaw. Good service, good timeframe, good pricing an all round excellent experience". I came in today (Thursday 14th May) to see if you had a small plastic repair fitting for my BMW 540i. The guys were cheerful and friendly. The correct fitting was soon found and payment was refused and I was just asked to remember A1 next time I need a radiator. 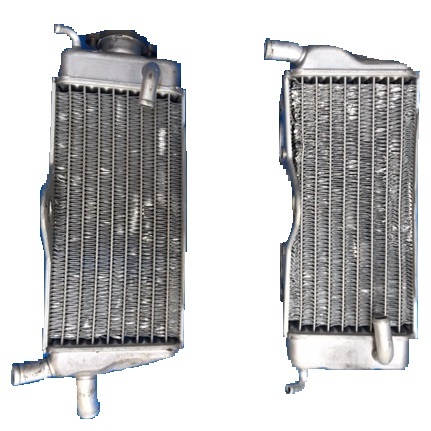 In fact you made a radiator to my drawing for my V6 engined Mazda 323 back in 2009 . The radiator was spot on and fitted perfectly, made quickly and for a fair price. The rad has been great and may even be too efficient! I inteneded to use the car as a toy but has since become my work car and as such sits in trafiic a fair amount as well as getting more spirited driving. In the 6 years that it has been installed it has performed perfectly. I'd just like to say thanks for some good old fashioned service and I have always recommended yourselves as a place to go to and I will continue to do so. I have attached some pictures so you can see what a tight fit the rad is in the 323. Just a note to say Thank you, for the best service I have received in a bloody long time. I called on Tuesday (of a short week) with a fault in my air conditioning on my Mercedes. I had it booked in for Wendesday morning - solved / home and hassle free by lunch time. A1 also rebuilt me a radiator for my Charger some time ago and I had great servcie then aswell, hence the reason for coming back. So thanks again to Nick and the Team at A1! I would like to take this opportunity to commend your company on the high standard of Customer Service I receive from both your receptionist (Raewyn) and sales consultant (Ryan). Working in a customer service role myself, I understand the importance of providing great customer service for repeat business, and these guys nail it. We have had a few issues (in the past)with wrong parts or late deliveries, but Ryan has gone the extra mile to assure these issues are kept to an absolute minimum, making our trading less stressful. Again thank you guys for your great work. I really enjoy dealing with you. I just wanted to email you and the Team at A1 Automotive Cooling to say "thank you" for the excellent customer service you provided me. I had a new radiator fitted and you also replaced the cabin filter in my air conditioning. It was amazing to drive to work this morning with the heater on and not breathing in the bad smells I had coming through the air conditioning before you replaced my cabin filter. 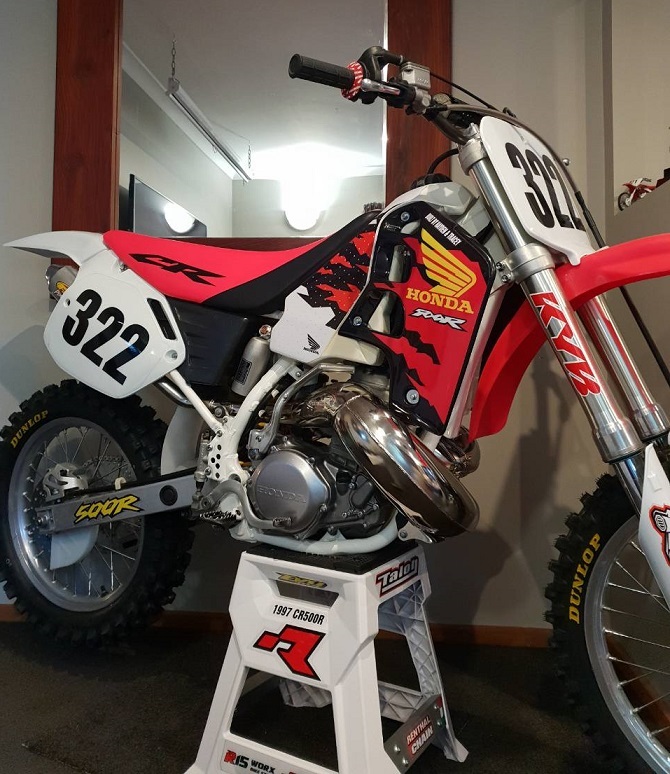 1997 Honda CR500r Motorcross machine. We were stoked upon the return of our radiators for this bike. They were a little tired looking to begin with. When returned they were straightened, cleaned, tested and looked great!! At a great price might I add. 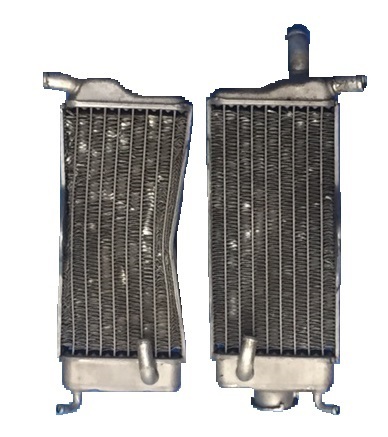 We fully recommend A1 radiators in the repair and restoration of vintage/classic motorcycle radiators. Knowledgeable supplier of generic radiators. Had what I needed on the shelf without modification required. Quote excl. GST. Got my air conditioning fixed at A1. Had a quote from a different air conditioning specialists of $1000 saying I needed a new a/c unit. Instead, A1 fixed the old one for $300 much better deal! The staff are friendly and take the time to tell you what they're going to do and what they have done. Picked up the car up on a hot nor-wester day and it was like driving home in a FRIDGE, Result! Just a note to say Thank you, for the best service I have received in a bloody long time. I called on Tuesday (of a short week) with a fault in my air conditioning on my Mercedes. I had it booked in for Wednesday morning - solved / home and hassle free by lunch time. A1 also rebuilt me a radiator for my Charger some time ago and I had great servcie then aswell, hence the reason for coming back. So thanks again to Nick and the Team at A1! Just a quick thank you note to the team at A1 Automotive Cooling. I had made the decision to build a Race Truck to compete in the NZ super truck series. This was my first venture into truck racing and I contacted Scott with the details of what I planned to build. We were talking 1600+hp with limited space to fit the Radiator and Intercooler assembly. A bit of homework by Scott and we had a plan on what we needed. The Boys in the workshop did a marvellous job of turning this into reality and what arrived a couple of days before Christmas was exactly what was required. Unfortunately on our second outing we had a major crash so it's back to the team to work their magic again. All in all just a massive thanks to all the team at A1 Automotive Cooling for helping me get my project on the track. Thank you guys for the time and workmanship you all put in to get a new radiator ready for the teams V8 Supercar we have based here in New Zealand. The quality of finish and workmanship are of the highest quality and most pleasing was the overall finish and presentation. It is good to see that there is a company who understands the need for performance quality and presentation in a radiator at a realistic price. Thanks again for your service and Keeping it Kiwi! We built our racecar 3 years ago with a V8 Chev motor which we had no end of trouble keeping cool. We were never able to finish races let alone meetings..... until we came to see the Team at A1. You guys took our problem on board, and built us a custom aluminium radiator which fitted the car perfectly, off to the track we went. The car completed it's first meeting of 4 races and did not overheat at all. We havehad the same result at the Queens Birthday meeting in Kaikoura. Both Dave and myself cannot thank you enough for your help and we are looking forward to sharing our successful times with you in the upcoming season. After unsuccessfully trying to locate a radiator for a clients Mustang that I am completely re-building, I wound up talking to Nick and the team at A1 Automotive Cooling. These guy's don't have a too hard basket, and if they do it would always be empty. We needed a big radiator in a small place with a pull fan and it had to look good as well. No problem even though I am based in Rotorua. I emailed the team a plan and before long I was talking to Scott the fabricator to check the detail. 5 days later I had a radiator that was a perfect fit, and a very happy customer. I deal with many businesses in NZ and the team at A1 are one of the few that provide first class personal customer service and back it up with a first class product as well as offering advise and experience in a friendly and genuine manner. A1 is a great name for this company because they live up to it. They have my confidence and I will not hesitate to use them again or recommend them to anyone. A1 automotive cooling has been helping me with a "v" mount set-up for my fd rx7. they have been very helpful in understanding what i am trying to achieve and the quality of alloy fab and customer service is THE BEST i have had since starting my project. Radiator arrived yesterday morning, and fitted up last night after work. Fits perfectly and looks awesome. Even got the seal of approval from my old man who has been a metalworker for the last 40 years, haha. Fan install looks really good, haven't wired them up yet bit I'm sure they will be great. I will be in contact at a later stage for radiators for other projects that are in the shed, they'll really set the cars apart from the crowd. Just wanted to say thank you for the fantastic job you guys done fabricating and improving the design on my radiator for my speedway sidecar. I know I really put the pressure on you guys with the short timeframe and short week(Public holiday) but you were confident you could get it done in time and you delivered not only on time but a product far better than I had imaged. I had asked for maximum capacity without altering the size, shape or mounting points. And that is exactly what I got! It Bolted straight back in! No problem! And for the cooling, with the old Radiator the bike was coming back in at around 130 degree after a race, over heating and dumping all the water/steam! Now with the new radiator it coming back in Just over 105 Degree and not a peep of steam or water loss! No more over heating! What a difference!! All in all I was extremely impressed with the service, Quality And turn around! Thanks again team! I will be recommending you to all! So expect a few more Sidecar radiators to fab up!! Just a quick note to say thanks regarding the fabrication of the custom radiator for my car. Your staff were very friendly and offered helpful advice regarding the design of the radiator to suit my particular application. Both the workmanship, detail and finished product greatly exceeded my expectations. Please thank the team involved, I truly appreciate all their help and efforts. I will definitely be recommending A1 to anybody considering a custom built radiator. "I had a F100 core made by A1 and was extremely happy with the way it was made! It looked great and workmanship was of a high standard.